Dogs play a very important role in a human’s life, especially service dogs. 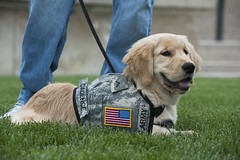 The term “service dog” is generally used for many different types of assistance dogs. 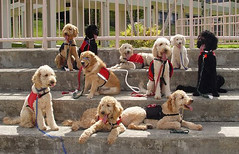 These include guide dogs, mobility dogs, hearing dogs, medical alert dogs, and autism dogs. There are also other types of dogs with jobs that help people, such as psychiatric therapy dogs and emotional support animals. The importance of service dogs is that they can do things that their disabled owners cannot. Guide dogs are trained to lead blind and visually impaired people around everyday obstacles. These dogs can benefit their owner by allowing them to get around faster, with more accuracy and fewer accidents. Guide dogs can also make their owners feel safer at home and on the streets. Mobility dogs are trained to retrieve items, open doors, help a person dress or push buttons for its handler. These dogs most commonly assist people with disabilities with walking, balance and transferring from place to place. More importantly, mobility dogs can increase the independence of a person who uses a wheelchair or has trouble standing. The purpose of a hearing dog is to alert people who are deaf or hard of hearing of general household sounds, like the telephone, doorbell, smoke alarm, and much more. Hearing dogs can provide sound awareness and companionship to their owners, while offering increased freedom and independence. 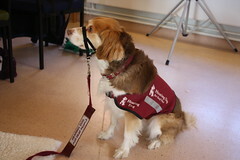 A medical alert dog is trained to assist people with a medical disability. These dogs will “alert” their owners of oncoming medical conditions, including heart attack, stroke, diabetes, epilepsy, etc. In addition, medical alert dogs are taught how to respond to these symptoms, whether that means bringing their owners medication or the telephone. Unlike a guide or mobility dog that helps with physical tasks, the autism dog is there for emotional support. These dogs can provide stability in a child’s life as well as offer a calming influence and improve focus. Research has shown that interacting with animals can help autistic children become more social and better interact with their peers. Dogs can also enrich the lives of people living with psychological, neurological and developmental disorders, such as Post Traumatic Stress Disorder (PTSD), Depression and Anxiety. Psychiatric therapy dogs can provide their owners with relief from feelings of isolation and provide a sense of well-being. Having a dog has also shown to increase a person’s mood and optimism. Lisa Podwirny is the owner of Ketchum Mfg. Connect with her on Google+!